The Crust Bucket food menu. Crust Bucket is a food truck owned and run by Crusty Sean in Splatoon 2. It is found in the center-right of Inkopolis Square. The Crust Bucket is a food truck owned by Crusty Sean, where Inklings and Octolings can buy food and drink that will give them bonuses for the next twenty battles. 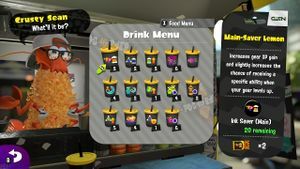 Each snack and drink requires a different Crust Bucket ticket, which can be sourced in a variety of ways, such as bonuses from Salmon Run, or as collectables found in Hero Mode's levels. Ordering foods from the Crust Bucket will boost the amount of Cash or experience earned from multiplayer matches, while drinks will increase both the chances of rolling a certain Ability on gear when it attains enough experience, and the amount of said experience it gets per round. The truck itself is yellow with a grey stripe on the bottom. The door and the side have the Crust Bucket logo. Next to the truck is a metal trash can and a chalkboard sign written in the Inkling language. The ventilation roof is open on the top, along with the server window, which Crusty Sean stands behind. In front of the window is a ledge which soda cans and water bottles are placed on. The truck itself is covered in various graffiti. Meals increase the amount of cash or experience gained after every online battle (except Private Battles) for twenty matches. All drinks increase the number of gear experience points awarded after a match by 50%. In addition, each drink increases the probability that, when a gear slot is filled, it is filled with the corresponding ability. Having a drink active gives its associated ability a 30% chance of being rolled. 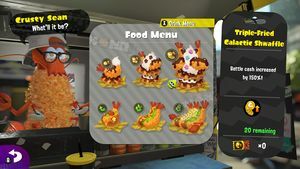 Low-level food tickets can be found as hidden collectables in some Octo Valley levels. Going back and collecting them again after they have already been collected once will award Power Eggs instead. After Agent 4 has bought every upgrade available at the Ammo Knights Enhancifier, they are be able to exchange 1500 Power Eggs at it to get a random food ticket. Completing a single Octo Canyon level with all nine Hero weapons will award Agent 4 a random food ticket. Similarly, completing every level in Octo Canyon with one of the Hero weapons will award Agent 4 with a random food ticket. Food and drink tickets can be randomly rewarded from Salmon Run bonus capsules, either in groups of one or three. After completing the main storyline of the Octo Expansion, Agent 8 can earn and exchange up to ten Mem Medals at a vending machine in the Deepsea Metro's Central Station, with food or drink tickets being given depending on how many medals have already been given to the machine. The first medal will award one drink ticket. The fifth medal will award three drink tickets. The seventh medal will award one Galactic Seanwich food ticket. The ninth medal will award one Triple-Fried Galactic Shwaffle food ticket. The tenth and final medal will award fourteen drink tickets, one for each flavor. If Agent 8 does not have any Mem Medals or has spent them all, they can instead exchange 15,000 C.Q. Points at the vending machine for a random item, which may be a food or drink ticket. The sunshade on the front of the truck has the Squid Sisters' silhouettes. Crust Bucket was first mentioned in the Russian translation of Squid Sisters Stories: Chapter 3, where Callie and Marie meet Crusty Sean there. Also, it was called a café at the time, rather than a food truck. The Crust Bucket resembles a Citroën H Van, a popular choice of vehicle for food trucks. The music played in the Crust Bucket is Crusty Sean's variant of Lookin' Fresh by DJ Lee Fish, the same music played in his original store Shrimp Kicks' from Splatoon. The Crustwear XXL is a Crust Bucket-themed piece of clothing, adorned with various versions of its logo. In one of the news quotes for Wahoo World, Pearl mentions that Crusty Sean has opened a shop in the food court there. The shop can also be seen in the background of the stage. The truck in the Square. The front of the truck. Note the Squid Sisters' silhouettes. The Crustwear XXL, a Grizzco gear item. ↑ Squid Sisters Stories chapter 3. Кэлли нашла Мари в кафе «Мак-да-рак». Translates to "Callie met Marie at Crust Bucket café." This page was last edited on 3 March 2019, at 10:49. This page has been accessed 56,206 times.